Shoulder strap accessory that attaches to easily carry your Hoboroll (sold separately). Dimensions: 8.5" x 3.5" x 1"
Ask anybody what they like best about traveling and the answer isn’t likely to be packing. Even for neat and tidy types, packing and living out of a bag can be frustrating. Inevitably, that folded shirt you’re looking for gets buried underneath other folded items and everything ends up in a heap. That’s why Chez Brungraber, an avid traveler and the founder of Gobi Gear invented a packing organizer called the Hoboroll. With five separate storage chambers, the Hoboroll lets you easily separate and organize your outfits, shoes, and other items. Use it all on its own like a rucksack for short trips and outings or place one or more Hoborolls inside a larger bag to create even more compartments for longer getaways. 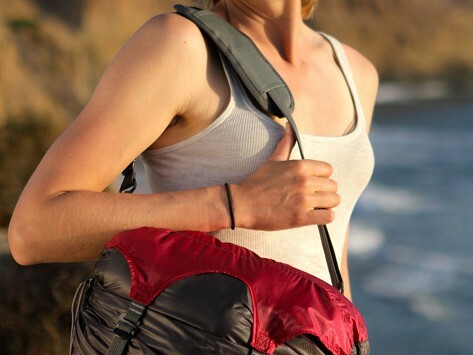 The Hoboroll also has two compression straps on the side so you can reduce the volume of the bag by up to 50%. And, it opens from both ends with drawstring closures making it simple to get your hands on that shirt whether it’s on the top or the very bottom of your bag. Even though the Hoboroll was originally designed with backpacking in mind, our testers found many other uses for it. It’s great in a gym bag, carry-on, or even in a traditional suitcase. Parents at The Grommet have even used it to help their kids organize their dance and swim bags. Why rummage when you can roll?